A few months ago I was at an event at RPM Italian in Chicago, one of the city’s latest “it” places. 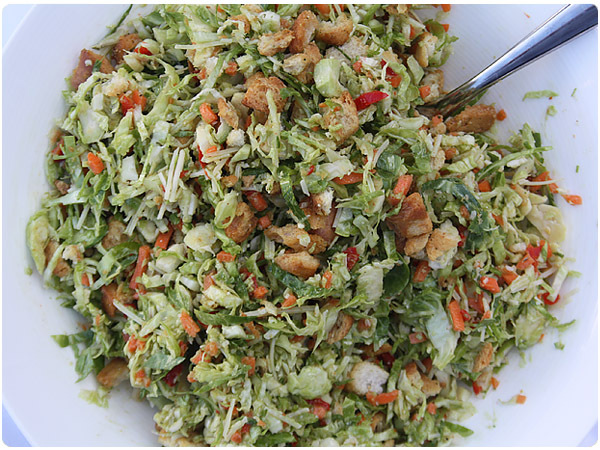 One of the dishes on deck for the night was this amazing Shredded Brussels Sprout salad. 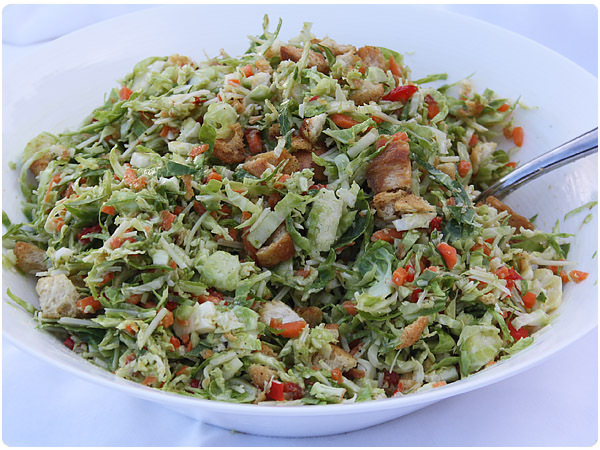 Unlike the roasty, bacon-y Thanksgiving style brussels sprouts (delicious as they can be) or the overcooked-underseasoned sprouts of so many people’s recollection (blech), this raw and creamy salad was like a revelation in sprouts. So I began stalking the internet for hints of how to recreate the recipe, or get close to it, and found this recipe. While I’m not sure that it’s totally accurate to RPM’s real recipe, a few modifications and creative liberties made it taste pretty close and equally enjoyable. It’s shredded texture trickery even had brussels sprout haters digging in. 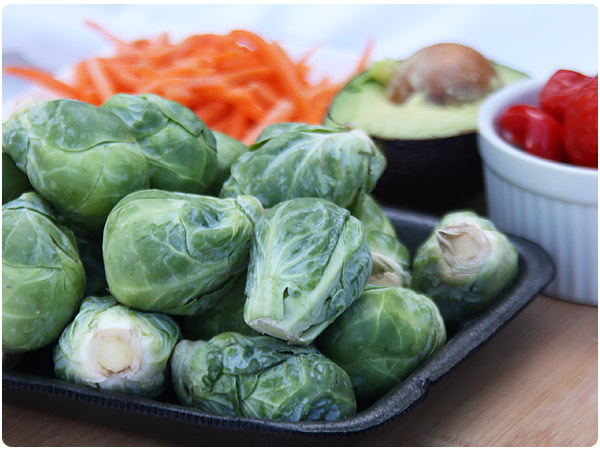 Chop brussels sprouts and place in a large bowl. First, trim the ends from the sprouts, then make very thin slices across the width of the sprout so that they resemble confetti. Once you have several in a pile, run your knife roughly through the sprouts to break up any rings. Add parmesan cheese to the bowl. Finely chop carrots and peppers, if using, and add to bowl. Toss to combine. Roughly chop croutons and set aside. Combine avocado, garlic, lemon juice, and peppadew juice in a small food processor. Drizzle in olive oil and keep pulsing. Add salt and pepper to taste and pulse again until creamy. Taste and reseason as needed. Just before serving, toss avocado mixture with salad and mix gently. Add croutons and gently toss. NOTE: The salad will keep as leftovers or for a second serving but only if you keep the avocado dressing and the salad separate until each serving. I love Brussels Sprouts but always just roast them with maple syrup, can’t wait to try this salad!